Free Instant Traffic for Your Niche Site - 3 Killer Tips! You’ve finally chosen your niche and you’re ready to go and take action, but how can you really turn the dial and make rapid progress when you start? The thing about working on niche websites is that you usually don’t get to see the benefits of your work for at least 6 months and usually not for over a year or potentially even longer. This is one of the main reasons why people give up, as they just can’t correlate the effort they are putting in with any type of reward, and in today’s ‘instant’ society, that’s just not good enough! The good news is that I’ve found 3 shortcuts for you that will help you create a really solid base for your niche site and start to bring you your first traffic within weeks, if not days. I’ve learned a lot of this from the training over at Human Proof Designs, so I’d definitely recommend signing up with their monthly membership, where you have access to over the shoulder video training as Dom builds out a couple of Niche sites, week by week. Firstly, you are building up a relationship with other blogs, who you may want to work with and outreach to at a later date. Secondly, you are diversifying your link profile, so that it looks more natural to Mr Google. My advice would be write really detailed comments and if possible ask questions, rather than just saying something like “I really like your blog!” as this will give you a much greater chance of getting your blog published. Make sure that you are commenting on blogs that are either in your own niche or in a related niche, so for example if you had a niche site promoting juicers, then you could comment on other blogs in the whole wider health niche. The other thing that you want to do is make sure that the blogs have been updated fairly recently, as it would be a bit strange commenting on a blog that had its last comment in 2012. Well, you can either use a tool such as dropmylink.com but I found that a bit hit and miss. I wouldn’t overdo this, but really think it’s a good way to start to get a bit of traction on your site. Most of the links that you will get will be nofollow links, however, if you can get some dofollow links that would be a bonus. This really is a gem of a tip, which was developed by Doug Cunnington over at Niche Site Project, which focuses on finding long tail keywords that are really low competition, which means you’ll be able to rank for a lot of them relatively easily. So what’s the secret to this magical potion? 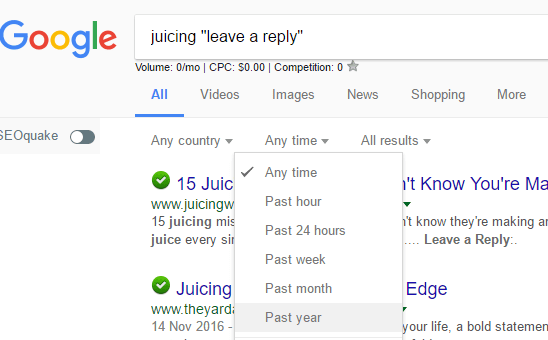 However, if you searched for ‘best juicer for apple cider’ this has only 10 searches per month and only 7 exact matches, so has a KGR value of 0.7 – this still isn’t great, but you get the idea. The downside with this approach is that you’ll need to do a lot of manual work to plug the keywords into Google, however, the results are well worth it. What do I do with the KGR Keywords? Once you have found a bunch of these keywords, then all you need to do is write an article of 600 – 1,000 words and maybe include a video and you’ll find that you’ll go straight to the top of the rankings for this keyword, as well as a bunch of other keywords that you might not even have though of before. What is this so great? Well, within a very short space of time you’ll see visitors coming to your site from these search terms, and that really is encouragement in a bottle right away!!! Last, but not least of our killer tips today is a technique where we will help you find keywords where forums are ranking on the first page in Google. Why is this important? Well, a forum really is an easy target in the search results and something that you can easily beat with a half decent article. BOOM, there’s a list of great keywords that you can easily target and get instant traffic with. If you use these 3 techniques then for sure you’ll be attracting visitors to your site in no time at all, and if you are clever with your keyword research this will be traffic, which is related to your niche and will potentially lead to sales further down the line! Hi Tammy, Thanks for the kind words. With regards to other commnunities I would recommend Authority Hackers, Human Proof Designs, Doug Cunnington from Niche Site Project and also Niche Pursuits. All of these sites have great information and podcasts that you can follow with fantastic information!